Comm Eye Health Vol. 27 No. 86 2014 pp 34. Published online 21 July 2014. The population of Uganda is estimated to be over 33 million, with a prevalence of blindness of about 1%. The following eye team members deliver eye care services at different levels. Tertiary level: ophthalmologists (there are about 40 in the country) and ophthalmic nurses (there are two), working at national and regional referral hospitals. Secondary/district level: ophthalmic clinical officers (OCOs). There are over 200 in the country. Primary level: nurses, midwives and other health workers who are trained in eye care and who work at health centres; they are known as primary eye care workers. Community level: community health workers (trained volunteers) who work in village health teams to provide health services at household level. There is an existing referral system, with a good degree of teamwork, across all the levels. Clinical officers or Uganda Registered Nurses (URN) can undergo a one-year diploma in ophthalmology (offered at the Jinja School for OCOs since 1989) in order to qualify as an OCO. The qualified OCO practices with the supervision of an ophthalmologist attached to the nearest regional referral hospital. In the rural areas, OCOs refer patients with complicated clinical problems to ophthalmologists and those requiring complicated refractions are referred to optometrists. They review patients after operations, perform extra-ocular surgery, assist surgeons in theatre, and conduct eye care outreach to schools, rural parts of the community and remote health facilities. At district level, OCOs coordinate eye care services (including planning and budgeting) and also train and supervise other eye care personnel. An OCO can become a senior and then a principal OCO. This is, however, only available to OCOs working at regional level. OCOs working at district level can be promoted within general medicine; however, they can then be sent to any health facility (sometimes to lead such a facility), where they will have very little time to practice ophthalmology. OCOs can specialise as cataract surgeons, refractionists or low vision workers; however, these skills are not formally recognised within the existing government public service structure. Specialist OCOs therefore miss out on promotion and any accompanying salary increments. lack of funding and opportunities for continued professional development. 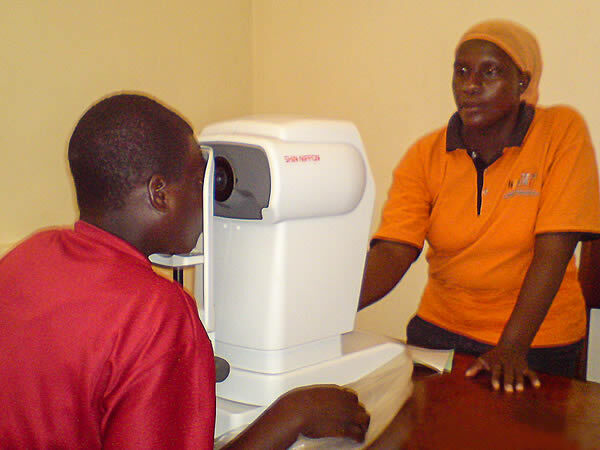 OCOs in Uganda are organised in a registered association called the National Association of Ophthalmic Clinical Officer and Cataract Surgeons (NAOCOCS). The association addresses coordination, governance and the social concerns of OCOs. The association organises annual continuing professional development workshops which most eye care workers attend. OCOs are represented at the National Prevention of Blindness Committee and its technical arm at the Ministry of Health. improving eye care data collection, reporting, analysis and utilisation at all levels. Ophthalmic clinical officers (OCOs) were introduced into East and Central African health worker government schemes in the mid-1980s. Given the desperate shortage of ophthalmologists, their main purpose was to identify and treat patients with common eye conditions. A similar cadre, the Technicien Superior d’Ophthalmologie (TSO) was later introduced in several Francophone countries in West Africa for much the same reason. OCOs and TSOs remain the backbone of the eye health workforce in many countries in East, Central and West Africa. They are primarily deployed in secondary health care units. They see patients referred from the community and refer patients with complicated problems to the tertiary setting. In the district or secondary health care setting, OCOs and TSOs work alongside the other eye health workers such as ophthalmic nurses, optometrists, refractionists and low vision therapists as a comprehensive eye health team. In many countries, the OCO and TSO remains a valuable team member who is able to independently manage many eye conditions. 1 Palmer J, Chinanayi F, Gilbert A, et al. Mapping human resources for eye health in 21 countries of sub-Saharan Africa: current progress towards VISION 2020. 2014, Human Resources for Health, In review.